Friday, May 31, 12–5 p.m.
Saturday, June 1, 10 a.m.–4 p.m.
Training over 250 horses a year takes skill and time. The trainers at Harmony have developed a system to get horses started under saddle and riding usually the first time they work with them. Come see the team in action as they take a horse that has never been ridden as they put the system to the test. Saddle Fitting: One of the greatest mistakes people make is to think one saddle fits all. That is not the case. Saddle Fitting is one of the most important things you can do to support your horses back and give them longer careers. Come learn from the professionals at Colorado Saddlery on how to properly fit a horse for a saddle. This might be the most important clinic you go to all day. Equine Assisted Activities and Therapies: Have you ever wondered what equine therapy is and what its benefits are? 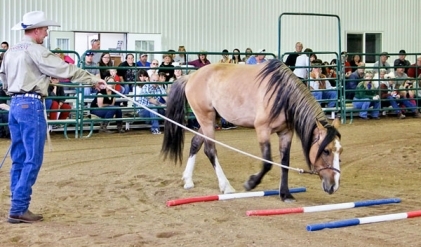 Join The TGEC as they do a “live demonstration and explanation of equine assisted activities and therapies”. Ask the Expert. Here is your chance to ask questions and have Jason show you how to get results. Power Steering. Learning to control your hands. Selecting the Right Horse: It’s hard to determine what horse your family should own. Attend this class and let Brent help you select and narrow your search to the right horse you should be looking for. Building Confidence in Horse and Rider: We all lack confidence from time to time on horseback. Horses lose confidence when they have a bad experience. Learn how to walk thru challenges with your horse so you can enjoy riding and gain confidence in the saddle. Tired on your horse not being balanced and transitioning smoothly? Get tips on getting your horse to transition from a walk, trot, lope, extended trot and get the proper lead changes. Horse Ownership 101: Are you new to the horse industry and thinking about getting your first horse? Do you own horses but feel you need to know more about horse ownership? This is a must attend class for all horse owners. Learn what it takes to own horses and care for them properly. Preparing your horse for the world requires your horse to deal with obstacles that come along the way. Ty will take you thru how to overcome obstacles and teach you how to add more skill to your horsemanship. Intro to Liberty: Basic ideas and principles of liberty work and how it’s complimentary to traditional natural horsemanship techniques, not contradictory to them. Using a horse from Harmony, I’ll demonstrate how to introduce liberty work to a horse who has no experience with it. While working with the horse, I’ll talk about how liberty work can help “difficult” horses and can improve your overall relationship with your horse. Fun with Liberty: Using one of her mustangs, Jessica will demonstrate how you can advance the basic liberty work with your horse. Will demonstrate and discuss how to train your horse to do things like liberty circles, side passing away from and towards you, the liberty “pick me up” at the mounting block, laying down on cue, the “come here” cue from a distance (great for hard to catch horses! ), and more. Will also touch on how this liberty method on the ground can easily translate to bridleless riding. When to Call the Vet – A presentation on the top 10 equine medical emergencies including what to do until the vet gets there and how to “bubble wrap” your horse so that you might not have to call in the first place. Healthy as a Horse – Vaccines, deworming, dental care and what wellness means if you are a horse. A presentation on what every horse owner should know about preventative care and general wellness care for companion and performance horses.